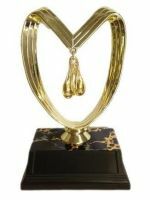 This unique Gag Gift Trophy stands approx. 7" tall and sports an actual pair of brass balls. This trophy is perfect for the daredevil in your life.